The Grand Canyon Brewing Company is teaming up with the Grand Canyon Expeditions for the trip of a lifetime! 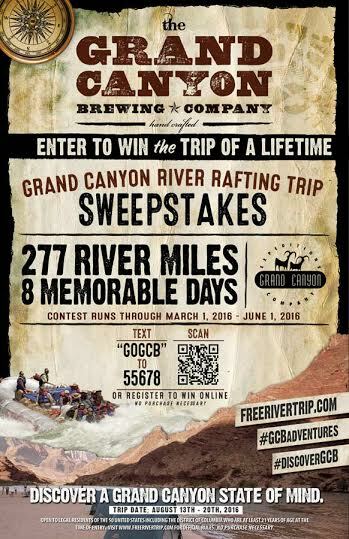 Now through June 1, 2016 thrill seekers and beer drinkers will have a chance to enter to win an eight-day rafting trip on August 13-20, 2016 with the Grand Canyon Brewing Company team. Discover a Grand Canyon State of Mind as you white water raft through 277 miles of roaring rapids on this amazing eight-day journey down the Colorado River. The awe-inspiring spectacle that is the Grand Canyon is breathtaking and like no other experience in the world. Thrill seekers and adventure junkies alike will delight in the opportunity to reconnect with nature and make new friends while rafting through one of the Seven Wonders of the World. The 28 rafting trip winners will embark on their journey together and alongside the guys that own and operate the Grand Canyon Brewing Company. Contest closes on June 1, 2016 at 11:59 p.m.
Overview of Terms: Open to legal residents of the 50 United States including the District of Columbia who are at least 21 years of age at the time of entry. Not open to employees, children or other immediate family members of those employed with The Grand Canyon Brewing Company, Grand Canyon Rafting Expeditions Company, Crescent Crown Distribution or HDE Agency and any affiliate organizations to this list. The Grand Canyon Brewing trip will be August 13-20, 2016. Offer valid for these trip dates only. Not redeemable for other dates or trips. For complete details, visit www.freerivertrip.com. Located in historic downtown Williams, Arizona at 233 W. Route 66, the Grand Canyon Brewing Company is a family owned and operated craft brewery producing over a dozen different specialty craft brews each year. The smell of bubbling yeast and fresh hops fill the air as the brewing team works to create their award winning beers. Copper tanks and stainless steel fermenters fill the room next to a newly renovated taproom with 16 different tap handles including Sunset Amber Ale, Horseshoe Bend Pale Ale, American Pilsner, Black Iron IPA, Grand Canyon Expeditions Wheat Ale, Coffee Bean Stout, Hop Bomber and a few guest beers – all from local breweries. Whether you’re camping, boating, hiking or kayaking down the Colorado River, the Grand Canyon Brewing Company encourages its fans to live curiously, seek adventure and discover a Grand Canyon State of Mind through the enjoyment of its handcrafted brews. To locate a pint of Grand Canyon Brewing beer near you, be sure to download the free Crescent Crown Distributing app to your phone and search for a neighborhood pub or retail location. For more information about the Grand Canyon Brewing Company, and to purchase beer to be shipped directly to your door, visit online at www.grandcanyonbrewery.com and be sure to “like” us in Facebook at www.facebook.com/grandcanyonbrewery. While in the Williams, AZ area, patrons can enjoy Grand Canyon Brewing’s hand-crafted beer at the Cruisers Route 66 Café and gift shop located next door to the brewery and tap room. For more information about the Cruiser’s Route 66 Café visit www.cruisers66.com and be sure to stop in the next time you’re near the southern rim!